Many years ago, while going to college in Minnesota, I purchased a golden retriever. 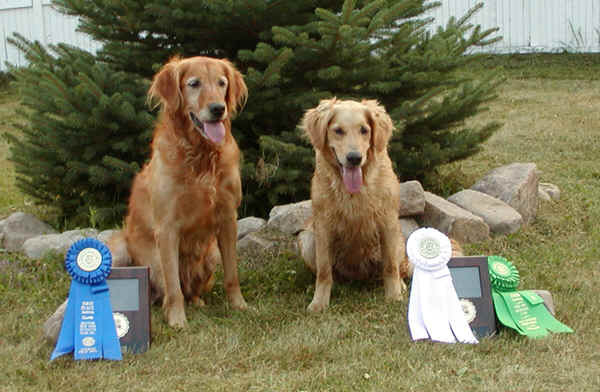 The breeder was raising and training field trial goldens. The breeder gave me a quick demonstration of what the dog was trained to do and I was awed. That puppy was the smartest puppy I've ever owned, the mythical Joshua. Unfortunately I learned a valuable lesson about dogs and cars and I had to put Joshua down at 9 months of age due to a crushed pelvis. My second golden, Quala, was not field bred and although a wonderful pet, did not posses the qualities that I enjoyed in Joshua. Although I was living in New Jersey, I contacted Joshua's breeder hoping for a repeat breeding. This search resulted in me purchasing Jessie, a FC/AFC Benjamin Rajah Frisbee daughter. She was an intense retriever that I trained for 4 years before demands of work and dog issues made me retire my dogs. Twelve years later, when Jessie's daughter was fourteen, I decided to get another field trial golden. The first Retriever Field Trial News that I looked in had two litter listings for dogs that were line breed on Benjamin Rajah Frisbee, I had to have one. The rest is a blur. Currently 7 Derby points with a 70% completion rate. The beginning of August 2002 takes us to Tonawanda NY and two field trials and a week of 10 hour training days. The season is off to a good start with 3 ribbons for 4 entries. Splash completed both Qualifying's with a Jam at Fort Pitt and a 4th at Western NY. Maggie Won the qualifying at Western NY to end her Qualifying career. It was the first time I had ever completed a field trial with either of these dogs. Professional handlers had handled them both to Qualifying wins. It is a sign that we are starting to work as a team. The season continued to be charmed. Splash earned a Qualifying 2nd at the Maine Ret. Club and was called back to the 3rd series of the Amateur. The final trial of the year was Colonial RFTC. Maggie received a JAM in the Amateur. The first time I have ever been invited to the last series of an All Age Stake.